Is our productivity increasing or decreasing? It has been decreasing globally over the last 10 years (about 30%). (Conference Board, June 2015) What is your productivity doing? Are you eager to grow revenues in new regions, but hampered by processes that do not scale? Are you having a hard time hiring new employees and then onboarding and skilling them quickly to produce outputs? If you have any of these concerns, operational efficiencies will impact your bottom line. In addition, understanding workflow and metrics could help your company make more effective choices toward profitability. You could benefit from process improvement. Process improvement provides a new viewing lens—to see workflow and inefficiencies from the company, customer, and employee perspectives. It provides tools and techniques to model current processes, analyze real data, and identify the root causes of bottlenecks. You can improve your processes for higher quality, greater agility, lower costs, scalability, and faster turnaround or time to market. How can you be in the other half who succeed with process improvement? This report provides three tools to help you make a good decision to see how changing behaviors and methods will impact your bottom line. A company self-assessment called The I-4 Process Capability Self-Assessment to measure your organization’s current level of process capability. An analysis of the elements in your company’s self-assessment. Questions to help you decide whether process improvement will bring the benefits you want. Take the Self-Assessment yourself right now. See the instructions below to take it electronically at https://www.surveymonkey.com/s/I4Capability. Then have several stakeholders within the company take the assessment, including executives, middle managers, and employees. See how each group responds to the provocative questions and determine where your company strengths and challenges are. Next, use this report to understand how each survey question points to one element of the McKinsey 7S Framework (explained below). 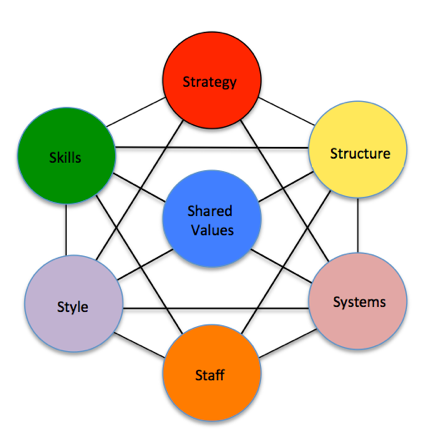 Consider how to align each element with other elements to build a holistic approach to increase operational excellence and company performance. Lastly, review the summary results for your company. In which areas is your company strong? Where are the leaders that make it strong? What challenges does your company still face? What would you need to do to build greater productivity and profits? Want a personal consultation? Send me a copy of your completed I-4 Process Capability Self-Assessment and your preliminary thoughts. I will provide you a free 30 minute consultation on how to develop a roadmap that will get your company off to the right start, build leadership and employee skills, and create results. Have you reorganized recently to better serve customers but not much has changed regarding customer service satisfaction? Is the company’s strategy changing your fundamental operations or just generating special projects? Do you use data from customers and internal operations as the primary driver for decision-making? Are you able to incorporate consistent processes as you grow into new regions and globally? After completing the assessment, count up how many of your answers are in Column 1 and then how many are in Column 2. The more answers you have in Column 2 the better, because Column 2 shows your company has more process capability, whereas Column 1 shows less process capability currently. Less process capability means more deficiencies, lower productivity, and reduced bottom line results. If you had 6 to 10 answers in Column 1 and 5 to 9 answers in Column 2, then your company is moving toward more process capability, but process success has been mixed. Indeed, the company may not know why it has seen some successes and other failures. 1. Have your reorganized recently to serve customers but not much changed regarding customer service satisfaction? Question 1 relates to to Structure, or how the company is hierarchically organized, how tasks and people are specialized, and how authority is divided. Companies will often create a strategic plan that has big goals, saying things like, “These are important goals. Pay attention to them but do them after your regular work.” If you answered “special projects” in Column 1 then your company is adding more work on top of the regular workload (or daily operations) and the strategic plan is not focusing on daily operations. To remain competitive, the strategy needs to impact the work of the core products and services, namely, the daily work. Ask yourself, does your company have a strategic plan? Is it communicated and available for all employees to see? Do managers and employees know how they can impact the strategic plan? If you want to impact strategy at the BEGINNING level, choose smaller process improvement projects that are within a single function or business unit. Save the more difficult cross-functional projects until the ADVANCING level. Question 3 relates to Shared Values, or the core values of the organization that serve as guiding principles. For example, if your company is still entrepreneurial in spirit, these shared values suggest a customer responsive attitude and a fast-moving pace. Decisions are often based on dictums like, ”Get the sale,” or “Do whatever the customer needs.” Process improvement might be perceived as slow, bureaucratic, and not innovative. Data gathered from customers and internal operations may not float to the top in company decision-making. Question 5 asks the about the customer and the feedback they provide. Are you capturing that data? What does it tell you? Do you have customer complaints that don’t seem to get resolved quickly and easily? This may be because customer complaints need to be resolved in several BUs and functions, and the company is not set up to accommodate this. I worked with one organization that had 412 backlogged customer issues. We developed a new method of high response customer service and issue resolution and got the backlog down to 0 in three months. The point is that the old way of handling customer issues just wasn’t working because those issues got lost and delayed between different vertical siloed units. Questions 6, 7, and 8 cover some of the challenges that get in the way of streamlined work–too much paperwork, departmental or individual shadow systems on desktops (such as desktop Excel files), numerous employee roles, and handoffs between groups. These issues cause waiting and misunderstandings. If your company is able to reduce this complexity, the process will move faster and have fewer errors. Regulations are necessary constraints, whether you like it or not. Are the regulations in your company an add-on to the work? If you could build regulation controls into the daily work processes, and minimize their delays and waste, the result would yield faster throughput and the accuracy needed. Regulations need to be part of efficient ongoing work and not just a “pain in the neck” that slows things down. 15. Does the company value the ability to analyze problems as much as it values domain expertise? The last question is about SKILLS, which refers to the distinctive competencies of employees in the organization, the management practices, systems, and technologies. Do the people predominately have technical skills in their own area or do they have wider skills they use to solve problems and analyze work? These wider skills will enable employees to work with data and processes (on their own) within and across a process. Yes, employees need technical skills in their own domain, but they also need process and analytical skills to look at workflow and analyze data for several problem areas within a work process. Do you have the leadership that will support initial process improvement projects with the right level of resources (people, time, money)? If you had 1-5 answers in column 2, then you are at Process Capability Level Three – ADVANCING. This special report provides (1) a short and easy company self-assessment, (2) an understanding about the results of the assessment, and (3) ideas for the first steps in your Operational Excellence Roadmap. For more specifics, send me a copy of your answers to the I-4 Process Capability Self-Assessment and I will provide you with a free 30 minute consultation on how to develop a company roadmap based your company’s culture, values, current process experience, and leadership style. Shelley Sweet, President of i4Process, Inc., is a leading BPM expert with over 20 years of experience. She has educated hundreds of individuals and organizations on how to better develop and manage their business process improvement projects through her successful consulting engagements and popular training workshops. She is the author of The BPI Blueprint: A Step-By-Step Guide to Make Your Business Process Improvement Projects Simple, Structured, and Successful (Cody-Cassidy Press, February 2014). Sweet’s book, The BPI Blueprint, and her training programs are based on a unique 3-PEAT method of modeling processes and analyzing data that accelerates operational improvements, and builds leaders and employees who sustain operational excellence. As a result of this methodology, her stellar track record includes over 100 complex projects that have successfully redesigned processes to eliminate waste, minimize cycle times, and greatly improve customer satisfaction for her clients. In addition to Shelley’s popular training workshops and webinars, business professionals also learn from following her popular weekly blog at i4process.com/blog. She provides her readers with ideas from her extended business process improvement experience, including practical guides for process modeling and analysis, recommendations for common obstacles, and discussions about key leadership and team roles. In addition to writing her blog, Shelley is a featured content contributor to bpm.com, the first and most influential news and analysis site dedicated to business process management. For media interviews, speaking, consulting and training inquiries, or book information, please contact Shelley Sweet: email: ShelleySweet@i4Process.com, call 650-493-1300, or visit her website at www.i4Process.com.